Gris-De-Lin, or Grey Linen should you prefer to translate from the groovy Gallic into the plain English of Bridgeport, Dorset is a singer/songwriter and multi-instrumentalist with a sense of playful quirkiness evident on her hard-to-pin-down sound and artwork. New album ‘Sprung’ has an amusingly eclectic assortment of descriptors from our colleagues in the world of musical reviews which includes the likes of “skronky jazz and glitchy esoterica” (Uncut). Now, there’s no room in the AUK glossary for such interplanetary labels, but there’s no doubting the originality on show here or indeed the potential for honing a young British talent into something more tangible. There’s much to admire about this lady. She plays most of the instruments on ‘Sprung’ and she’s toured Europe extensively. The album itself was recorded in a nursery school and the sound is modern folk with electronic overtones. ‘Your Ghost’ opens the album and producer Chris Hamilton, best known for his work with electronic act Squarepusher has achieved a compressed sound with warm, fuzzy backgrounds and otherworldly vocal effects. The lyrics come across as vulnerable, almost wired and yet the listener is left grasping for their meaning. Good old boogie tunes these are not. ‘The Kick’ has a sax intro, again compressed with some kind of supersonic effect-laden software and dystopian visions a la Blade Runner become the picture of this disturbing soundtrack. Hers must be some nursery school. Whatever your personal taste, Gris-De-Lin is doing something right. BBC Radio 6 have taken a shine and she’s performed on the BBC Introducing sessions. The title track and first single see a shift to more central ground with a minimal, slightly grungy guitar and the vocals hiding behind 1920’s style analogue crackle – designed obviously to accentuate the progressive atmospherics rather than to mask the limits of the vocal talents on display. ‘Sprung’ is a patchwork of emotional rebel femininity and a cauldron of sonic and lyrical exposure. The stand-out track, ‘Marching Band’ is an example of the best of that exposure. It’s futuristic Bob Dylan, poetic and unforeseen; soul-searching in a world of information landfill – defenceless yet with a screeching guitar outro that’s aggressive in the extreme. Ultimately, though, there’s been a lot of rhetoric surrounding Gris-de-Lin and not enough substance to justify all the hype. 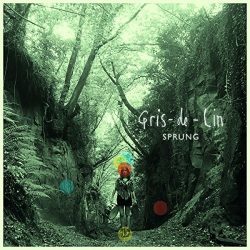 But hey, it’s early days and if debut albums are a springboard then Gris-De-Lin has truly ‘Sprung’. Progressive alt-folk from the Avant-Garde Dorset Enlightenment.